Ramadan Fabric Markers Tote Bag – Hello Holy Days! With school out and summer here, little ones may be accompanying you to the mosque for night prayer (tarawih). 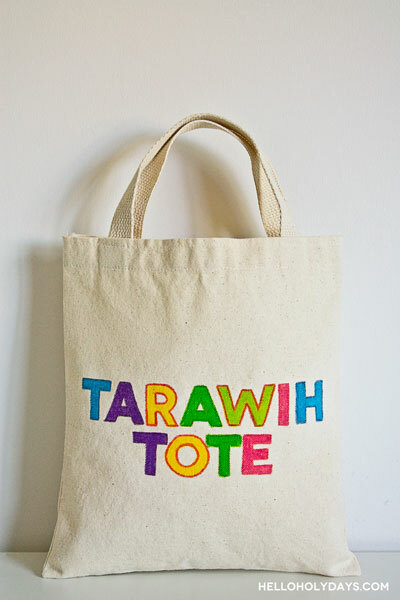 Have them make a fabric markers tote bag to fill up with activities they can take along to tarawih prayer. If your mosque has a babysitting program, have your child write their name on the tote bag, and the belongings they put inside, to ensure they don’t get lost. Download and print clip art, enlarging or reducing to fit the size of your canvas tote. Place transfer paper on top of tote, carbon side down. Place clip art on top of transfer paper and trace using a pencil. Remove clip art and transfer paper and colour in with fabric markers.